I was reading Neil Shubin's 'Your Inner Fish'. And in his chapter 'Adventures in Bodybuilding' he gives some interesting ideas for precursors to bodies (though I don't the ideas are his, I'll list his references). Choanoflagellates, he states, were once thought to be free-living sponges. Sponges can be made into single cells, but then aggregate again to form bodies. However after gene sequencing it was shown that choanoflagellates are much more similar to microbes. These organisms contain collagen, which is used in other organisms for body building, but form different structures in choanoflagellates. 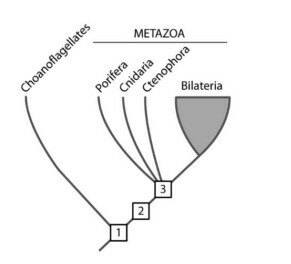 According to Shubin many other signaling and adhesion molecules used in development were found in the choanoflagellates and used for different purposes. He cites the work of Nicole King of UC Berkley. I wonder how you could form that into a testable hypothesis? Just one possible test, according to this hypothesis choanoflagellates should show signs of being intermediate between animals and microbes in the body building respect, which they do. They should also show signs of being intermediate in other regards, aka they should fit a phylogenetic profile with different traits agreeing.